Finally. After all that development, it’s finally time to actually run our package. So, how do we do that? With the project deployment model and SSISDB, executing packages in SSIS 2012 is actually pretty easy, and you’ve got quite a few options. A lot will depend on when you’d like to run the package: some options are better for ad-hoc executions, some are for automated execution. Another factor will be where you’ve deployed your package, since not all execution methods can be used to access packages stored in SSISDB. Let’s take a look. 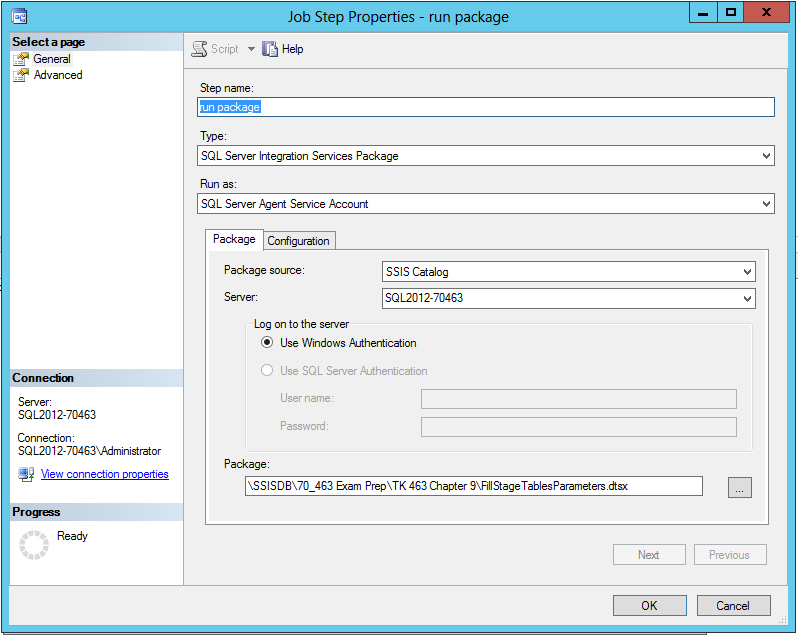 The easiest way to execute a package deployed to SSISDB on-demand is through the SSMS interface. Right-click on the package and click Execute. This will open the Execute Package dialog box, where you can specify values for parameters, change connection managers, override properties in your package, and specify a logging level. Once you’ve configured everything, click OK to execute. As with most things in SSMS, you can use the Execute Package dialog box to configure everything like you want it, then script the execution from there, making it a whole lot easier. If you’re using SSIS to load a data warehouse, it’s very likely that you’ll want to execute packages in a more automated fashion. And for that you’ll likely use SQL Server Agent Jobs. Configuring a job step to run a package stored in SSISDB, is simple. Create a new job and add a job step. 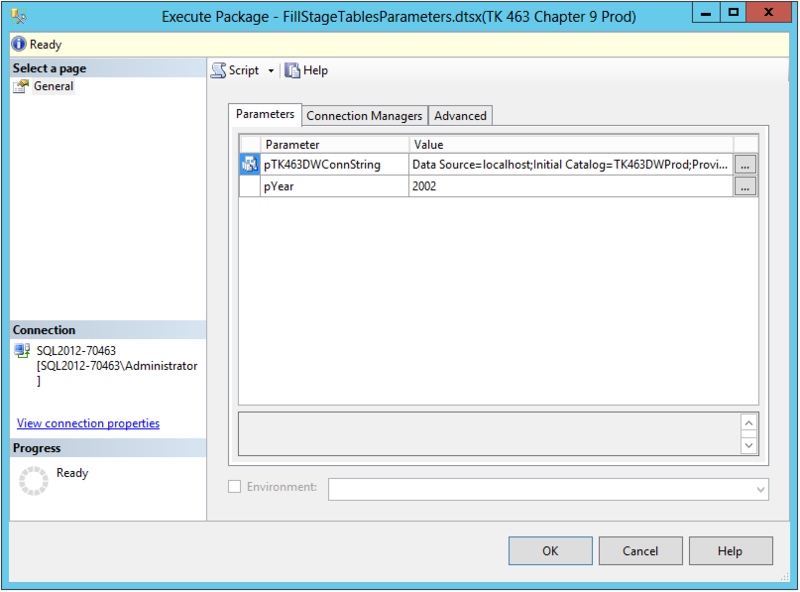 In the new job step, select SQL Server Integration Services Package type, and select the appropriate Package Source (e.g. SSIS Catalog) and Server. Enter the package path or click the ellipsis to select your package. Click on the Configuration tab and you’ll see the same options for configuring parameters, properties, and connection managers that you saw in the Execute Package dialog. Once you’re done, click OK. Schedule your job and you’re good to go. Of course, there’s still the DTExec.exe command line utility for executing packages outside of the SSMS environment. Note that there’s a difference between DTExec and DTExecUI. DTExec is a command line utility that can be used to execute packages deployed to SSISDB, as well as packages deployed to a file system or even the msdb database. DTExecUI, however, is a GUI interface that cannot be used to run packages stored in SSISDB. For the PowerShell geeks out there, Microsoft’s got you covered too. Although there aren’t any SSIS PowerShell cmdlets yet, you can still use the SSIS management assembly to access and execute packages stored in SSISDB. I won’t go into specific examples here, but check out the resources at the end of this post for great examples from Matt Masson at MSDN.